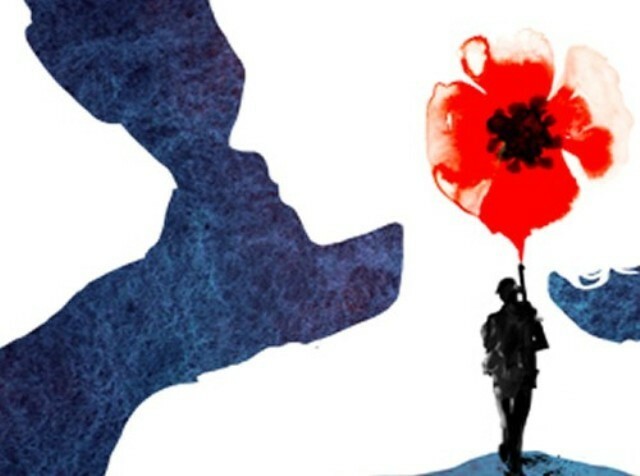 Flowers of the Forest is a timely production for the World War One centenary, set as it is exactly 100 years ago in October 1914. It comes to the Jermyn Street Theatre via a battered Welsh library copy of the 1933 script that caught the attention of the theatre’s artistic director, and is a beautifully written drama of a harrowing history. The First World War is particularly tragic because of its joyful beginnings, when soldiers confidently marched to often horrific deaths. Flowers of the Forest works with this premise very well. It moves between happy, optimistic and an almost idealistic view of life in 1914, where we flit back to after present day 1933, and its reverse. A budding war poet writes of the ‘blessings of our days’, but by the end, he can’t even bring himself to see the beauty of a country walk ("you should take a walk with me on no-mans land, carry the body of the dead best friend whose face you stepped on"). His girlfriend aborts their baby, because nothing can come into a world where death only awaits (and in this play, written just before the Second World War, that view was not entirely pessimistic). That all sounds a bit heavy. In fact, there’s some sparkling acting here that makes you feel the energy and optimism of this age. Gabriel Vick’s Richard Newton-Clare, with his cheeky grin and gleaming brillcreamed hair, comes from an age of exuberance yet untainted by too much knowledge of the world. Max Wilson’s Leonard Dobie gives one of the most truthful performances we’ve seen this year, as the terminally ill young polymath, passionate about everything not least the lessons and history of war. We’d hasten to say there are caricatures, except these are needed to bring some light to the dark material. And they run deeper than you might think — Debra Penny’s funny, sour-faced spinster Mercia is also a frightened person addicted to making herself miserable. Her rejection of the doomed Thomas Lindsay is less about his enlightened views on Germans, and more about her disbelief in the possibility of happiness. There is complexity in this chocolate box seeming world, though Victoria Johnstone’s nostalgic set beautifully conjures the look and feel of the time. Flowers of the Forest is the opportunity to understand more about the heart-breaking beginnings of the First World War and the devastation it left behind. Worth going to see while you can, it's unlikely this play will be picked up again soon from the library shelf. Flowers of the Forest runs until 18 October at the Jermyn Street Theatre, SW1. Tickets £22/£18. Londonist saw this play on a complimentary ticket.